Having Jesse home means that I'm back to cooking a whole variety of things - though lately, Jesse's been suffering from an awfully sore mouth with ulcers (if anyone has any cures, we're willing to try!) so I've been cooking soft foods. 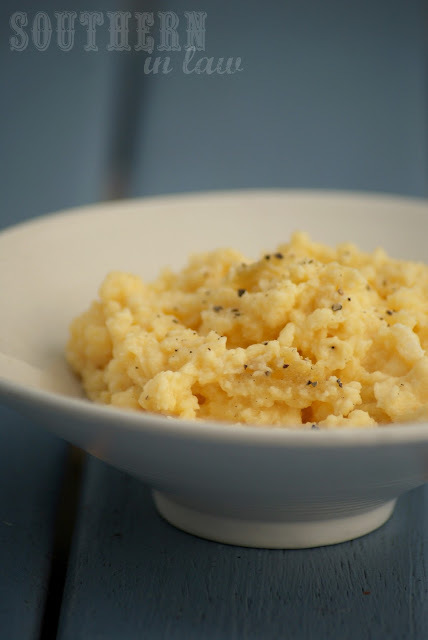 While mixing up a pot of what Jesse says are The Best Scrambled Eggs, I thought that I should share with you some super basic recipes that are easy peasy and you'll use over and over again. These scrambled eggs are one of those recipes. They're creamy, fluffy, light and you'd swear they're full of butter and cream - but what you mightn't have expected is that they're incredibly low in fat and only contain 2 ingredients! This recipe is one of those which I hide from Jesse until it's cooked and he eats it. You see, they have a secret ingredient - cottage cheese. Jesse hates cottage cheese - but in these eggs, he loves it - and had absolutely no clue that it was cottage cheese that made these the ultimate scrambled eggs! On the stove, heat a small frying pan over medium heat. Whisk all ingredients in a bowl until combined. Pour egg mixture into heated pan, leaving for about a minute until set. 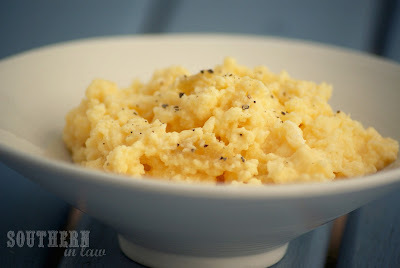 Scramble eggs and continue cooking, stirring occasionally, for about 5-7 minutes or until cooked through. So tell me, do you have a recipe with a secret ingredient? I have plenty of recipes with healthy secrets - and they don't taste healthy at all! If you have any simple, basic recipes (or any recipes at all!) that you'd like to see, let me know! I hope Jesse feels better soon! I'm not surprised he likes the eggs. They look delicious! I really need to hop on the cottage cheese train pronto! If they are mouth ulcers, L-Lysine is what will cure them. I get ulcers when I eat too many acidic fruits and vegetables - so I just take L-Lysine every day and it keeps them away. Ah! Thanks for letting me know that, Christine! I'll have to look into it! I don't know if it's because he bites his mouth and then it leads to the mouth ulcers as they get inflamed or what - but they're incredibly painful when he does have them. Thankfully they have started to heal using a different treatment, but I'd prefer they didn't come back again! I hope he heals quickly. Is he allergic to Sulfates? Have him check his toothpaste to make sure there are no SLS (Sodium Laurel(eth) Sulfates which are common in most all toothpastes. It's a sudsing agent. Try a sensitive toothpaste or natural toothpaste option. Some newer toothpaste ingredients of popular brand pastes even cause chemical burns in sensitive people. He's actually not allergic to anything! (The total opposite of me with 5 million allergies!). That's really interesting that it's in most toothpastes - I'll have to check that out! Thanks Jeneen!